Hello ... Hello ... my old friends ... It's great to see you once again! Another independent and talented band who feature both on my Friday radio show and on Hamilton Radio in general are Vegas With Randolph [VWR]. The DC based band sent their latest  release "Above The Blue" over the pond last month for Yours Truly KJS to listen to and review accordingly. And what [at first listen] appears to be a great if not manic fusion of guitar driven American Power Pop gives way to some wonderfully constructed songs and superb studio work. After the second and third listens, Yours Truly KJS was happily driving around tapping my fingers to this most excellent album that pleasingly also features guest appearances by fellow ELO Beatles Forever [ELOBF] featured artistes Maxi Dunn and Vinnie Zummo too. "Above The Blue" comprises:  "The Better Part";  "Above The Blue";  "Some Time To Live";  "Supergirl";  "A Lesser Fool";  "She Does It For Me";  "Summertime";  "Marisa";  "Lagavulin For Christmas";  "The Tree Song";  Double Play: "End Of The Party";  Double Play: "Since You're Not Around";  Double Play: "Alone";  Double Play: "Wondering";  Double Play: "Even Though";  Double Play: "Light Of Day";  "Above The Blue [Reprise]";  "The Sippy Cup Song"
I like the catchy "A Lesser Fool" [featuring the wonderful Maxi Dunn on vocals], the ballad "The Tree Song", the anthem that is "Even Though" and the rousing "Light Of Day". Add to that the string laden reprise of the title track and you have an attractive and highly enjoyable album to savour! 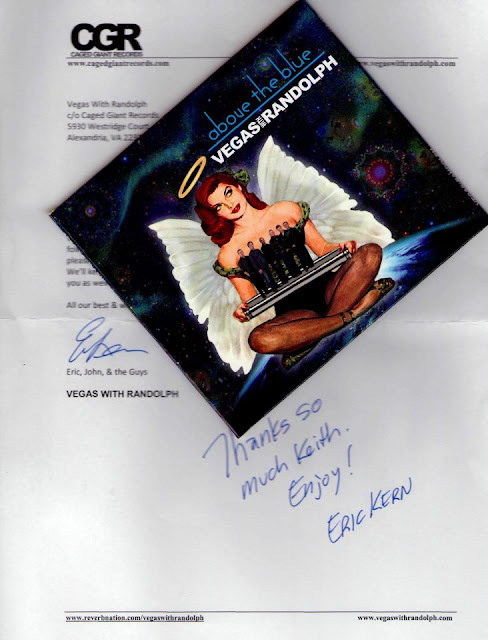 ELO Beatles Forever [ELOBF] recommends "Above The Blue" by Vegas With Randolph to those enlightened folks who enjoy the music of ELO, Jeff Lynne, Roy Wood, The Move, The Idle Race, 'Brum Beat', The Beatles, Pugwash and related artistes. Thanks so much for the kind words, Keith and for all your support on your show. We truly appreciate it!